The Indian Journal of Dermatology has published the results of a case-control study into levels of zinc and iron in the blood of women with Female Pattern Hair Loss. It was the belief of Iraqi researchers from the Department of Pharmacology and Toxicology at Basra’s College of Pharmacy, that certain trace elements can influence this hereditary condition. This theory has also been long-held by many hair loss experts based on previous research, and the Basra team set out to prove it with their own data. Two groups of participants were selected for this trial; there were 55 women in total, all aged between 20 and 45 years of age. 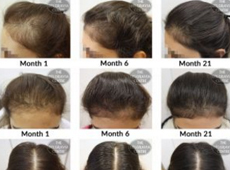 The first group comprised 27 women with a professional diagnosis of Female Pattern Hair Loss; the second comprised 28 women, age-matched to the first group as a control, with no hair loss condition. Due to women tending to be more susceptible to thinning hair due to external factors than men, there were many exclusion criteria for the first group. These included not having issues relating to androgen excess, including hirsutism, acne, PCOS, or menstrual cycle disturbances. Furthermore, those who have illnesses or have been exposed to medications which may cause hair loss, or where there has been ‘significant physiologic stresses‘ prior to their clinical diagnosis of androgenic alopecia, were also ruled out. Each set of volunteers had hair samples and their bloods taken then tested for zinc and iron levels. The results were then compared between groups and the data analysed. Therefore, the conclusion was reached that, although the women’s zinc and iron levels did not seem to influence the extent of their hair loss, the fact that those with Female Pattern Baldness had less of these trace elements, shows they “might play an important role in the etiopathogenesis of [Female Pattern Hair Loss]”. “There definitely is a direct relation between zinc and iron levels and hair loss,” confirms Belgravia senior hair loss specialist and superintendent pharmacist prescriber, Christina Chikaher, who has also been instrumental in the development of the centre’s exclusive Hair Vitalics food supplement range. These contain zinc, selenium and biotin alongside a range of other highly-targeted vitamins, minerals, amino acids and botanical extracts. “Along with selenium and biotin, zinc is one of the only substances for which claims relating to its benefits to hair are legally permitted. 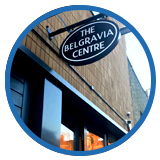 Our experience over the years with Belgravia Centre patients has shown that iron and zinc are indeed key factors in influencing hair loss. 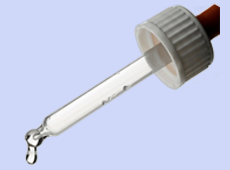 A large percentage of our clients show lower iron levels and this is even more prominent in our female patients. Although blood test results do not usually show zinc levels, it is more than just a coincidence that many of these clients, with iron deficiency and taking iron supplements also take zinc supplements and seem to think that the effect is positive. Often hair specialists will advise women worried about thinning hair to have a blood test so that their iron levels are checked before coming to a consultation. This additional information can be useful when establishing the precise hair loss condition – or conditions, as more than one can present simultaneously – that is present. From there, it is possible for tailored hair loss treatment course options to be recommended to deal with the shedding aspect, whilst should any further underlying health issue be suspected, the client can be referred to a doctor or given information as to what to ask their GP to test for. 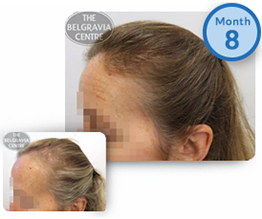 View Belgravia's hair loss success stories, with photos and comments from women with thinning hair who are using our treatment programmes.